ALWAYS A DELIGHT to welcome Sammi from Trespass in Falmouth, who has become one of our stalwart supporters. 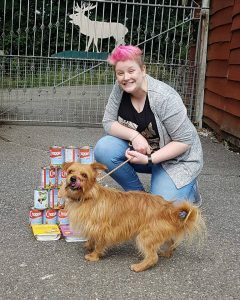 Sammi arrived with donations from the very kind customers of Clemo’s pet shop in St Just. Judging by Toby’s expression, I suspect he thinks its all for him! Thank you, Clemo’s, and thank you, Sammi, for getting it to us!